I know, I know, I said I wasn’t going to write while on vacation. But I just can’t help myself! 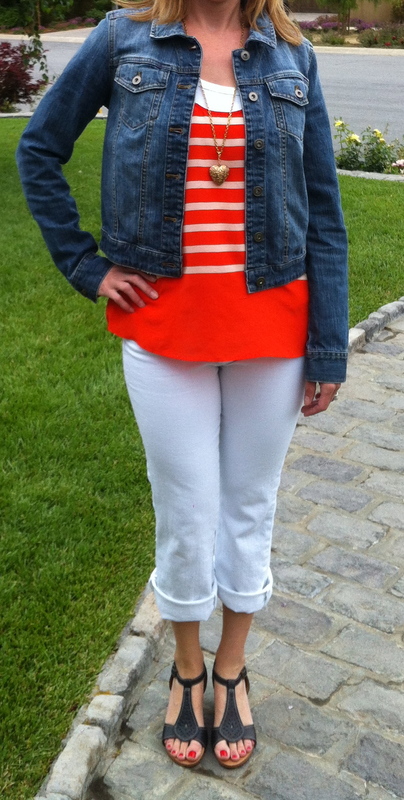 Here is my friend Heidi wearing a cute orange tank, white jeans and a denim jacket. Best of all are her fabulous new shoes. They are made by Clark’s- Indigo. They are super comfy and stylish at the same time! Love that! Hi Heidi-the orange top is great!! You must be in California…with my beautiful friend Heidi. She is very stylist. Hi Laurel! And thanks, Maria – you are very kind. Love those adorable cuffed jeans!